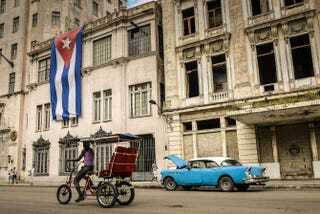 A bike-taxi and a vintage American car are seen in front of a building decorated with a large Cuban flag on Dec. 31, 2013, in Havana. In a stunning display of mic-dropping, post-midterm comeback, days before the holiday recess set in, President Barack Obama announced the first massive thaw in tensions between the United States and Cuba in more than half a century. The implications of the move are, no doubt, enormous and far-reaching. Not only did the embattled POTUS completely trash, then burn, premature political obituaries written last month, but he also put in motion a geopolitical boom for the ages. Normalizing ties between the two hemispheric rivals, separated by only 90 miles of idyllic blue water, will certainly trigger earth-quaking ripples. Understand that it doesn’t mean a full lifting of that infamous 54-year-old embargo, yet. Two Republican-dominated chambers of Congress will have to wrestle with that unpleasant task next year. However, it will mean a reopened U.S. Embassy in Havana, along with relaxed trade, travel and banking. Not only will you be able to catch a direct flight to the massive island nation of 11 million, but you’ll also be able to use your debit and credit cards. The ball is in Republicans’ court … can they hit it? Since Republicans wanted both the House and Senate so bad, they can have it—along with an uncomfortable vote on lifting sanctions against Cuba. That severely complicates the political calculus for the GOP heading into 2016, especially for likely Republican presidential contenders such as Sen. Marco Rubio (R-Fla.) and former Gov. Jeb Bush (R-Fla.). Conventional wisdom rather stupidly assumes that this puts Rubio in a good position—just because he’s Cuban and—oh look, Ma—Cuba is in the headlines. But his opposition to lifting sanctions puts him at odds with a much younger Cuban-American electorate in Florida. Polls show that many Cubans stateside are tired of listening to their elderly uncles gripe about Castro over angry domino games in the Miami heat all day. They see Jay Z and Beyoncé making trips to Havana and they want in, too. Florida won’t be an easy pickup for Republicans despite Gov. Rick Scott’s (R-Fla.) thin re-election win last month, and that decisive Cuban-American electorate is leaning blue. Combine this announcement with the president’s gamble on immigration reform, and you can see Caribbean Latinos and other voting, black-Diaspora migrants coming out strong for Democrats in the next cycle. Yes, haters: He can still master the geopolitical chessboard. Don’t count out Obama when it comes to diplomacy and the extremely complicated game of foreign policy. It’s the type of slow-moving, deliberative environment he prefers. Dominoes are falling all around this. Conservatives are recklessly clowning the prisoner swap of two Americans for three Cubans as amateur hour, but don’t look now: Not only did the U.S. just get a new friend in its backyard, but it just grabbed a longtime BFF from Russia, Iran, North Korea and a neighboring Venezuela on the brink of a coup and political collapse. All four are smarting from sanctions and cleverly designed fast-dropping oil prices, making it too pricey for enemies to cozy up with Cuba as a thorn in America’s geographic backside. Vladimir Putin gets pimp-slapped (for a change). This move just proves that you don’t need military firepower or nuclear brinkmanship to reach an objective. Nowadays you just unleash banking warfare and set your enemy’s economy into monetary free fall. Just ask Iran. Since the Soviet Union, Cuba has long been a reliable Russian friend and was expected to remain that way as Moscow reopened a spy base south of Havana and forgave nearly $30 billion in Soviet-era debt. But this move could take that chip off the table for Russian President Vladimir Putin, who—let’s keep it real—is being forced to cut quiet deals with President Obama over Ukraine, contrary to popular opinion on the subject. POTUS just got a partner in the fight against Ebola–and a possible solid for U.S. interests in Africa. Cuba has had assets in sub-Saharan Africa since the 1960s because Fidel Castro successfully played on rising Pan-Africanism as a way to maintain support from the island’s massive Afro-Cuban population. It was Cuba, after all, that was fighting South Africa’s army in Angola while training anti-apartheidists against Pretoria. So it’s no surprise that Cuba sent nearly 200 highly trained doctors to fight Ebola alongside U.S. troops and aid workers. It’s not as if any Western nations—or even China, Russia or India—are stepping up like Cuba, a country long admired for its advanced medical training and free health care. As Ebola turns longtime enemies into virus-ending frenemies, the U.S. will surely see if it can leverage a lucrative channel into African economies and a relationship that helps stop the spread of Islamic militants throughout the continent. All the pieces are there for the right move at the right time.